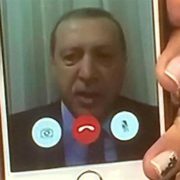 The name Erdoğan raises several questions for speakers of English. One concerns the unfamiliar Turkish letter ğ; this is readily converted into English w. But the vowels are more problematic. Here I’ll discuss the stressed initial vowel. The nearest English equivalent would be the pronunciation of the word air (ɛr in America, ɛː in southern Britain). If a foreign name is only rarely used, its pronunciation may vary considerably. But if it becomes frequently used, a consensus generally emerges. For example, English speakers generally opt for their ‘air’ = SQUARE pronunciation in Camembert, their ‘er’ = NURSE pronunciation in Lucerne. 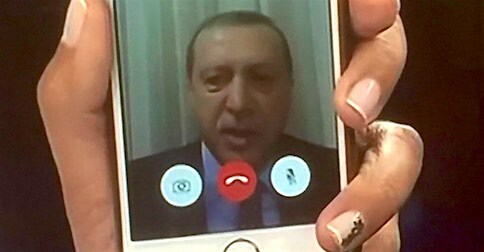 The weekend’s events have put Turkey’s president on everyone’s lips. So what are we hearing on British TV? This choice, between a generally more accurate SQUARE type pronunciation and a more English NURSE type pronunciation, arises with various foreign names, including Merkel and Berlusconi. Regarding the final vowel of Erdoğan, the most accurate English choice would be the PALM vowel, as in Botswana. This is the option chosen by Americans. Although some Brits use PALM, we can hear in the clips above that their majority choice is the TRAP vowel. This difference between American PALM and British TRAP often arises in foreign names, eg Ghandi, Vietnam, Sri Lanka, Milan. Perhaps that exotic letter ğ somehow interferes with the influence of the w on the following a. So what’s the Turkish pronunciation, Geoff? The latter makes it easier to hear stress on the second syllable of Recep. According to Wikipedia, “most speakers lower /e/ to [æ] before the coda /m, n, l, r/”, hence the transcription [ˈæɾdoɑn], but I wouldn’t feel compelled to transcribe the vowel in the above clips as opener than [ɛ]. The clips also suggest that the most accurate English vowel in the final syllable would be PALM /ɑː/, the Americans’ choice. Thanks! I am most struck in the sound clip above by the nasalisation of the final vowel and deletion of final [n] (at least, I can’t hear it!). I also hear the name as two syllables, so no [o] as such, just a [w]. Agree with you that the initial vowel is borderline CV3 and ash (sorry no IPA). Good point. Forvo has quite a few Erdoğans, and most end with nasalized vowels. But these have final n, auditorily and visibly on Praat (maybe the prevocalic ones, despite the glottals, are a liaison effect). Of coures my Words of the Week posts are short and relatively non-technical. Here I assumed without discussion that (aside from picking up that ğ ‘is’ a w) news people are reacting mainly to the spelling. The first clip here has Jon Snow saying ˈəːdəgən in 2012. I doubt he does that now.